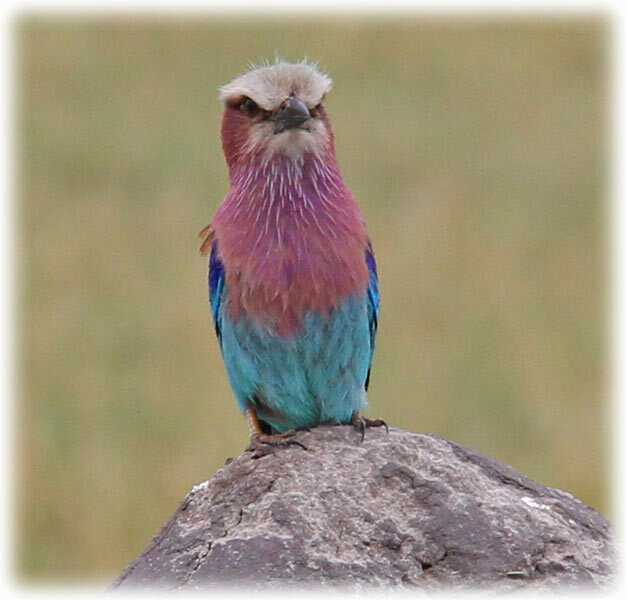 The Lilac-breasted Roller (Coracias caudatus) is an African member of the roller family of birds. It is widely distributed in sub-Saharan Africa and the southern Arabian Peninsula, preferring open woodland and savanna; it is largely absent from treeless places. Usually found alone or in pairs, it perches conspicuously at the tops of trees, poles or other high vantage points from where it can spot insects, lizards, scorpions, snails, small birds and rodents moving about at ground level. This species is unofficially considered the national bird of Kenya. Lilac-breasted rollers are found throughout southern and eastern Africa. 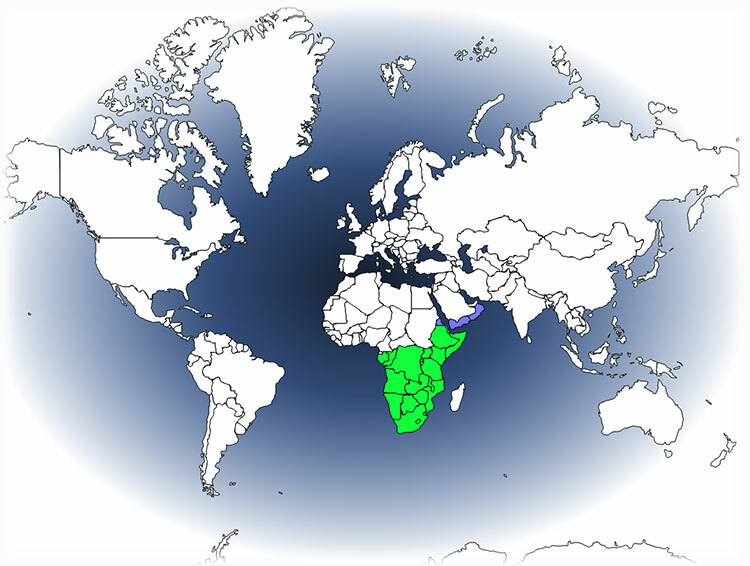 Their range extends from the Red Sea coast of Eritrea through to southern Africa, where they are common in Namibia (excluding the Namib Desert), Botswana, Zimbabwe, and northeastern South Africa. C.c. 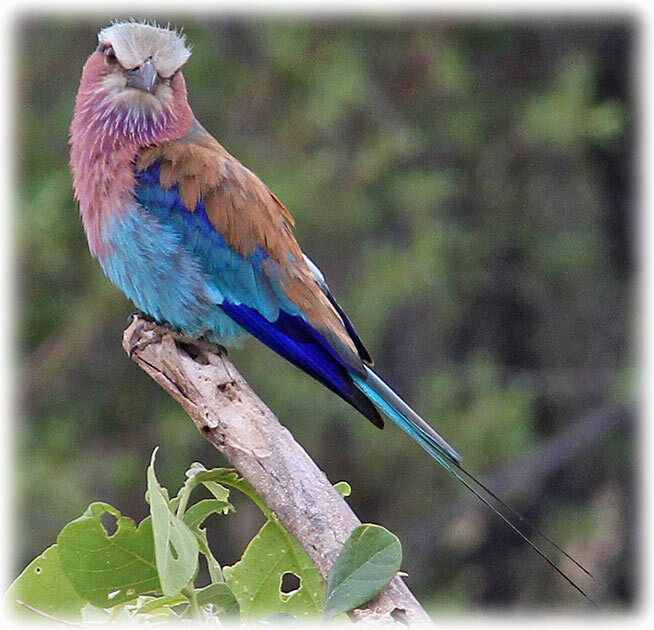 caudatus, the true lilac-breasted roller is a non-migratory species, while its counterpart, the blue-breasted roller (C. c. lorti) migrates from northeast Kenya to northwest Somalia to breed from late April to mid-September. 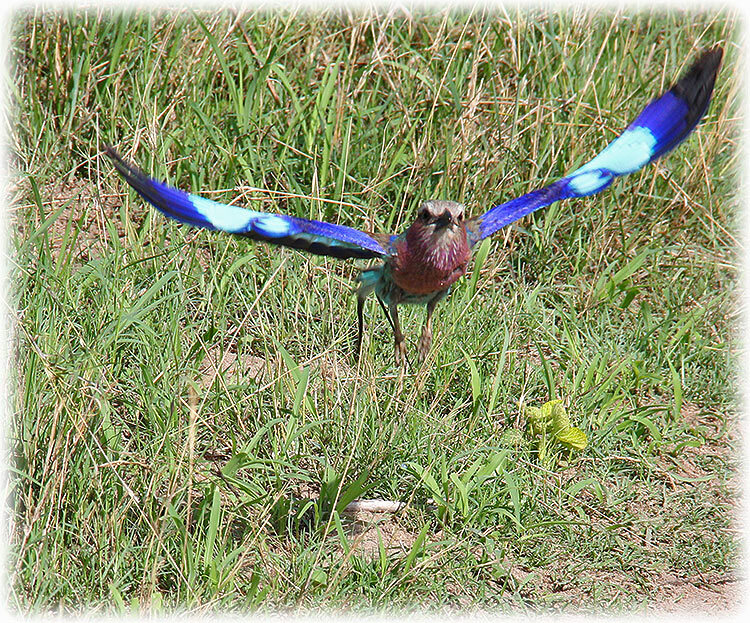 Lilac-breasted rollers are most abundant in Kenya, where they are unofficially considered as the national bird. Both subspecies live in grassland habitats that border trees and shrubs, as the birds use higher perches for feeding and nesting. Lilac-breasted rollers are rarely seen outside of protected areas, where they are commonly sighted along roads and paths. This is because roads create an ideal borderline habitat for the birds to perch and search for prey. However, lilac-breasted rollers avoid other human-influenced areas and are not found in urban or rural areas unless they are abandoned. 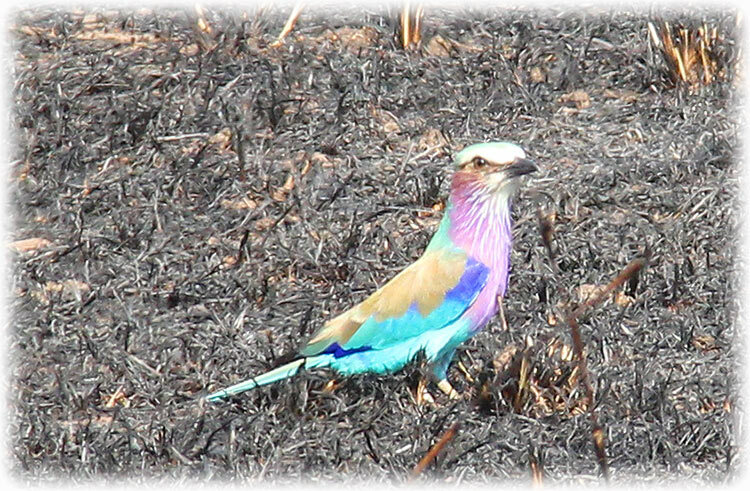 Outside of protected areas such as national parks, lilac-breasted rollers may rarely be seen when farmers burn land for agricultural use. Forest fires stir up insects and other invertebrates, and birds can be seen swooping in for easy prey. Lilac-breasted rollers are in the Coraciidae (roller) family of birds. 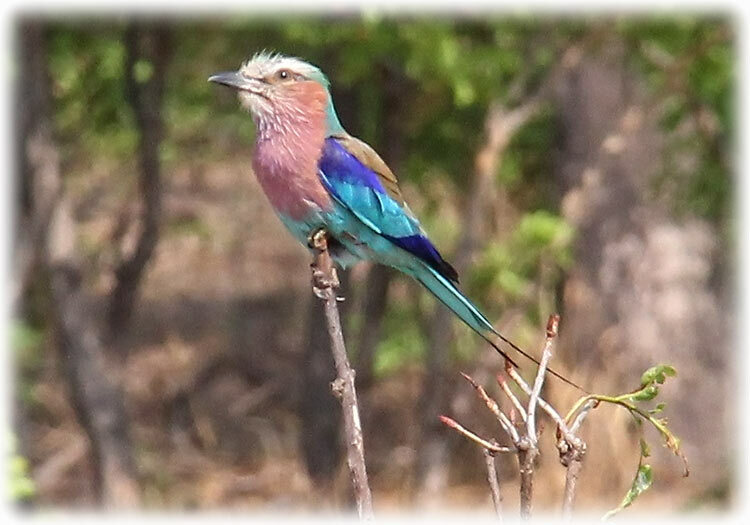 Alternate names for the lilac-breasted roller include the fork-tailed roller, lilac-throated roller and Mosilikatze's roller. 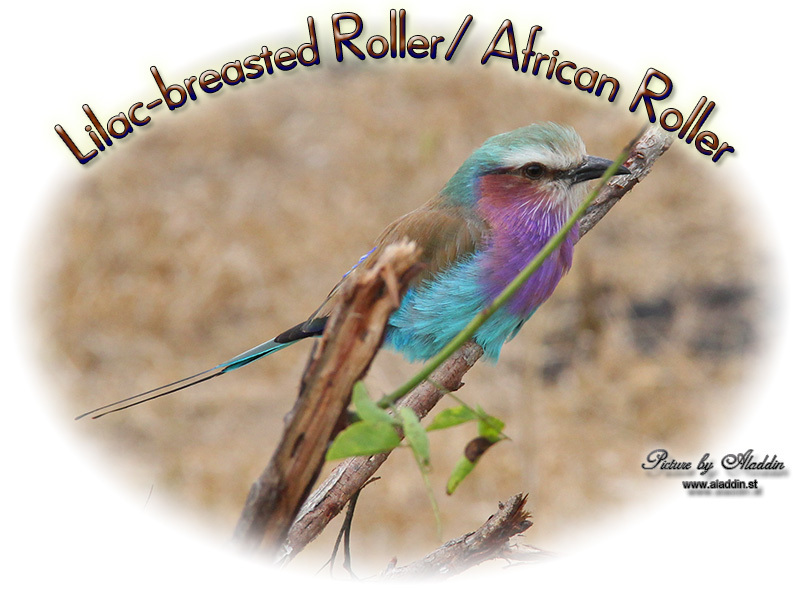 The alternate name 'lilac-throated roller' may also be used to describe a subspecies of the Purple roller. In the field, these crow-sized rollers are often perched alone on a tree in a grassy clearing. 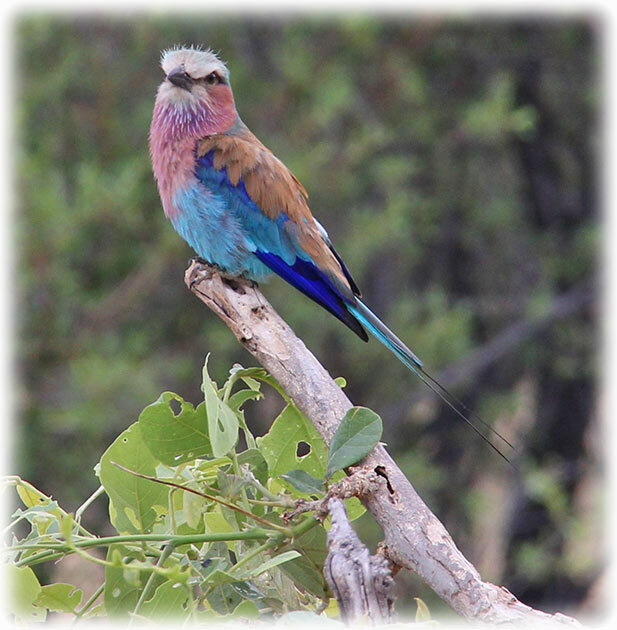 Lilac-breasted rollers are almost unmistakable with their bright plumage, but may be confused with Abyssinian Rollers in Turkana Basin of Kenya. For C. c. caudatus, look for a lilac throat that deepens into a darker lilac breast. The crown to mantle is olive, and the cheeks and ear coverts are a lilac-rufous. In the subspecies C. c. lorti, the crown to mantle is blue instead of olive, and the breast is azure. The throat is lilac, and some blue-throated rollers have a lilac patch on the lower abdomen. Both subspecies have long black outermost tail feathers that are absent in juveniles. 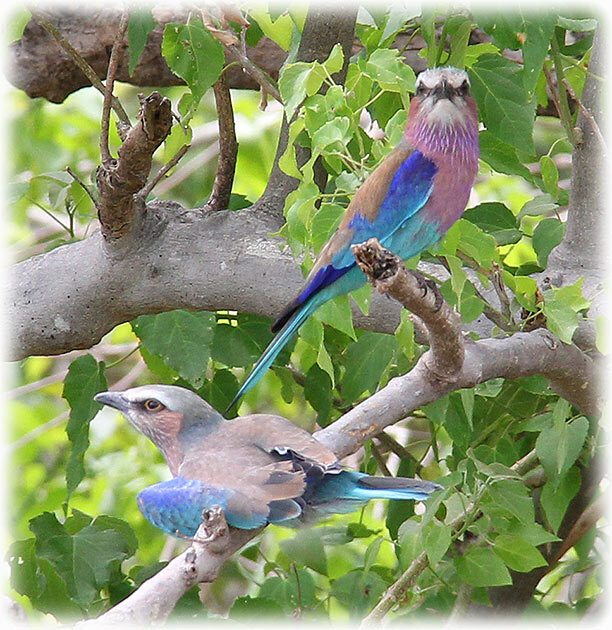 Lilac-breasted rollers are not sexually dimorphic but males may be slightly larger than females. 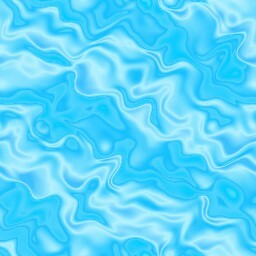 The average mass is 104 grams, and length ranges from 36 to 38 centimeters. These acrobatic fliers have an average wingspan range of 50 to 58 cm. Unique to rollers (family Coraciidae) are syndactyl feet, in which the second and third digits are fused. The call of a lilac-breasted roller is a harsh, sawing "rak rak rak" that is used during flight. Usually, the bird will perch to sing. Blue-breasted rollers breed from late April to mid-September in Somalia. Lilac-breasted rollers breed at various times of the year, depending on the location and season. Both subspecies are monogamous and build flat nests of grass in dead baobab, coconut, or a casuarina trees. Some birds may nest in hollowed out tree cavities about 5 meters off the ground. Lilac-breasted rollers do not create the cavities themselves; they take over nest spaces that have been previously hollowed out by woodpeckers or kingfishers. Males and females are protective of the nest and will fly in a rolling pattern as a territorial display. During courtship, lilac-breasted rollers with fly upwards and then tip forward with the wings closed. Then they will flap their wings to gain speed towards the ground while calling loudly. 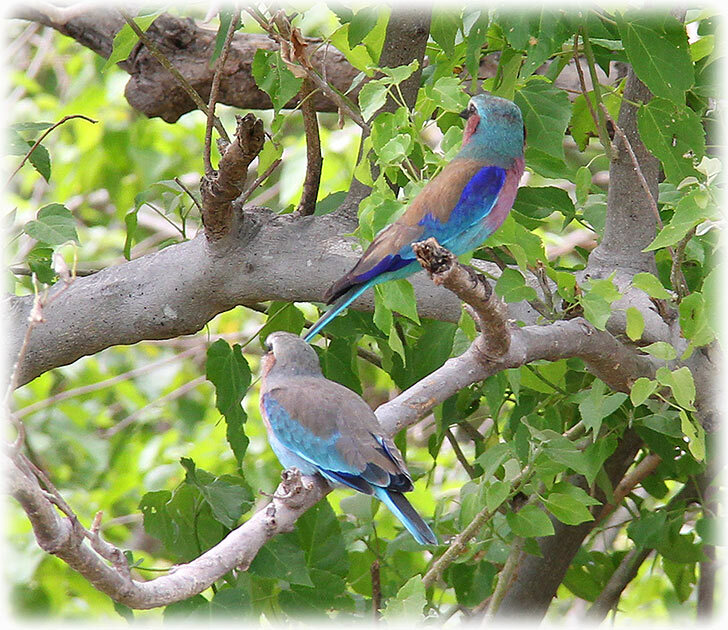 Typically, lilac-breasted rollers in Somalia will lay three to four eggs per breeding season. In southern Africa, the average clutch size ranges from two to four eggs. Male and female partners will take turns incubating the eggs for 22 to 24 days. Hatchlings are born altricial, becoming fully feathered after 19 days. The diet of the lilac-breasted roller is primarily insectivorous, consisting of ground-dwelling insects, arthropods, amphibians, and other small vertebrates. They are in the hawking guild of feeders. Because they feed on insects, Lilac-breasted rollers will perch to scout out prey from a higher vantage point (including from atop of large herbivorous mammals) before swooping in and grabbing prey with their beaks. If their prey is small, they will swallow it on the ground. These aggressive birds will carry larger prey back to a perch and beat it until it is dismembered. 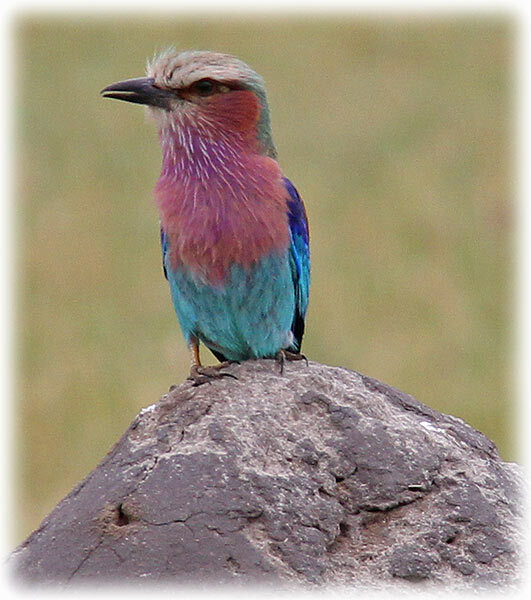 According to the International Union for Conservation of Nature and Natural Resources (ICUN), the lilac-breasted roller is of least concern. The large range and stable population size contribute to these findings. IUCN Red List of Threatened Species. IUCN. 2016: e.T22682874A92966607. doi:10.2305/IUCN.UK.2016-3.RLTS.T22682874A92966607.en. 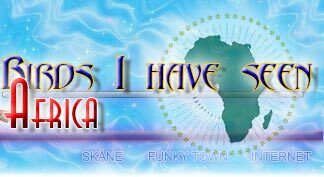 Retrieved 14 January 2018.